Consumer Reports: Mitsubishi i-MiEV is "crude" and causes "range anxiety"
Consumer Reports has taken issue with the i-MiEV's electric range, which it calls "disappointing"
Consumer Reports has just issued an update on the all-electric Mitsubishi i-MiEV, which they purchased back in February. Unfortunately for Mitsubishi, the hatchback electric car did not hold up particularly well in the all-important “electric range” category. Consumer Reports’ test-drivers has been accumulating miles on the i-MiEV over the past few months and has concluded that the vehicle doesn’t go as far as they would like on a full charge. The site uses the phrase “range anxiety” to illustrate the uncertainty surrounding the i-MiEV’s electric range, or lack there of. According to Consumer Reports, the i-MiEV produced disappointing electric range totals in February through mid March, despite an unseasonably warm winter. The i-MiEV averaged just 56 miles per charge during Connecticut’s mild winter, which consisted of mainly 40 to 50 degree weather. The i-MiEV’s miles per charge rose in the springtime averaging a consistent 61 miles. Consumer Reports indicates that on one occasion the vehicle attained an impressive 77 miles. That said, Mitsubishi claims a range of 80 miles per charge, a distant figure from Consumer Report’s overall average of 59 miles. The less-than-stellar driving range proved to be quite the deterrent for Consumer Reports’ test-drivers. In fact, testers became apprehensive about driving longer distances in the fear that the vehicle would lose its charge. “No one can come to your aid with a gallon of electricity to tide you over… If your EV runs out of get-go, it means calling a tow truck,” said Consumer Reports. On the bright side, Consumer Reports does state that the i-MiEV charges in a reasonable amount of time. The vehicle’s drive battery draws on 16 kWh for a full recharge. This process usually takes approximately six hours using a 240-volt charger, which is above average. In addition to efficient charging times, the i-MiEV posses an awfully low operating cost of 3 cents per mile, based on the national average of 11 cents per kWh. While its operating cost is lower than the Nissan Leaf (3.5 cents per mile), the i-MiEV has a much shorter range than the Leaf (75 fewer miles per charge). Consumer Reports contends that the Leaf is a “much better car” and is worth the higher sticker price. The Leaf is priced at $38,100 compared to the i-MiEV’s $33,630 (not including federal tax incentives). Range anxiety aside, Consumer Reports does not seem to have a whole lot of positive things to say about the i-MiEV. The consumer review site claims that the EV is “crude and uncomfortable” as a car. Furthermore, Consumer Reports contends that the i-MiEV is not a suitable substitute for a commuter vehicle. The EPA gives the range as 62 miles, which is close to the 59 that Consumer Reports found. Plus, the EPA rating is based on a combination of Highway and City driving, and the CR does not report what proportion of each they used, consequently, a fair comparison cannot be made. Range anxiety exists if someone drives the car on a trip that exceeds it's limit, thus if you know that it will only go 45 miles on the interstate at 65 MPH, then don't plan on going that far and you have no reason to become anxious. In general, I have respect for CR, but in this case I don't think they knew what they were doing. Check the Leaf, its range at highway speeds is far less than in city driving. If you have the $5000, then go ahead and get a Leaf, if not, enjoy your 3 cents per mile in the Mitsubishi i. Consumer Reports has a standard battery of tests they perform on a closed track to simulate both city and highway driving. It is explained on their website. They test all vehicles the same, no matter their drive train or type. Many gasoline and diesel vehicles have also done poorly on these tests and been reported as such by CR, but they aren't newsworthy since they are just "normal" cars. Unlike electrics, which this site seems to have a particularly unbalanced love affair with. CR is a little confusing at times and has different ways of treating different products. In one sense, it is supposed to give you the best bang for your buck. 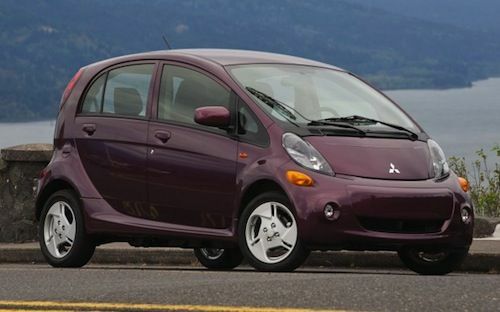 If the Mitsubishi i MiEV isn't at that price, than what is? Why would wna to test this little tiny car for distance. It's a city car. Why test it for anything else? Is anyone testing Ferraris' for city driving and have the result weigh in heavily? We would all laugh at it. Finally, I don't why these tests insist on depleting batteries in order to find out how far you can drive. That's not how you best use an EV. You plug it in whenever and that's it. As far as range anxiety, I have it with my gas cars when I'm traveling long distance on the road. Look at it as what it is, an affordable and efficient electric city car, no more, no less. CR is just weird and shoots itself in the foot at times. One look at this car told me I would never own one. Ugliest thing in production today, or very close to it. I mean, it's no Megane, but it's uuuuugly. This car is the same as the Peugeot EV and it's faults are well know. It is small, uncomfortable (even for city driving), and will not sell in the US very well. It is only even a consideration, due to the lack of EV's on the market and this one is the cheapest, for now. The Nissan might be more money, but it has more "wow" appeal and certainly does not look cheap, toyish, or odd. I believe Mitsubishi will shut down soon, because this car is not the savior they are counting on. It is quite the opposite, in fact. Hi Arlo, I don't why you think this is Mitsubishi's "savior". It would certainly show they are not all there. The i MiEV is a test and we are at the dawn of EVs. The car isn't uncomfortable to drive, even in city traffic. I had one lent for a few days and it was good for what it is a city commuter. I own iMiEV and I have been driving it since March 2012 in New Jersey. I am disturbed of so many negative reviews of iMiEV by so called experts, who own and operate gasoline cars and just think that the way they operate their gas cars they will operate EVs and kill them because they don't function as conventional cars. Unfortunately, this car was build based on Japanese consumer insight, not American and this is why it is disliked in the U.S. Let me state here that my typical range is around 80 miles, which involves mostly local driving with light occassional A/C usage. Why occassional? Because I don't think I need it, and because I am the actual EV owner - not just test driver who wants to demonstrate that EV's have limited range. My record range was on my recent trip to Long Island and I was able to reach 93.4 miles on a single charge with 1 mile remaining. How can you do that? Well, at first place, you have to own the car and know it. That does not happen in a couple of days. The measures that I have taken involve proper driving style in B-mode, modest acceleration, max speed 40 MPH and yes, I did not use A/C. I have also learned that using up the charge in a single trip gives better range as the battery needs some warmup. If I set the speed limit to 65 MPH, use A/C carefully (still feeling comfort), I am confident to reach 75 miles of range. I just don't understand how CR could consistently get only 56 miles in Feb/Mar and 61 miles in Apr. Driving in D-mode and going fast between traffic lights, abrupt breaking with A/C on high? Maybe with defroster? Maybe it is the difference between base model that I have and the SE model they tested? Anyway, range anxiety is term that fits well GM to highlight Volt and for that matter, this is the only EV (so far) build according to U.S. consumer insight. Other than that, range anxiety does not exist for me. Early in my ownership, I have done challenge test by flooring my iMiEV in D-mode on a Highway (up to 81 MPH) with heater on and the estimated range was around 45 miles, so yes, you can drain the battery quickly. Have I done it since then? No! Why should I? Why should any other EV owner? CR reviewers are not owners, they don't care. Sorry, but I'm not willing to pay $30,000+ just to find out if a car is right for me by owning it first. I want to know if it's right, THEN pay the money to own it. That's what CR and other magazines, including Torque News, are about. Showing normal, average people what cars (be their gasoline, electric, or whatever else) are like from a normal person's perspective. There is a lot more to America than the coasts. Not necessary. CR is not the best source of news or report. They often claim best bang for your buck but often fall very far. I often read some of the best computers ratings were the ones I had the most problems with my clients and ironically enough, made the most money on. The i MiEV is a great city car and at that price, it would be hard to beat it for the long run. Consumer Report is a bit of a non-issue these days. They more often miss the mark than not. I said: " That's what CR and other magazines, including Torque News, are about." That does not read: "CR is the bestest thing on the planet! Everyone should have 10 subscriptions!!" Personally, I've usually found Consumer Reports to be on the mark. We bought a washing machine ten years ago on their recommendation and it's still running strong, even after daily loads thanks to two toddlers (diapers and such) and a move. Our Honda Civic in 2000 was a Best Buy recommendation and we still have that, running great at 187k+. I don't go to them for electronics because electronics are fickle and nobody can predict reliability. I build my own computers anyway. The point I was making is that we can't all afford to just go out and buy something just to see if it's what we want or if it's going to work well for us. Even if you can afford to do that, you'd be stupid to do it. So we rely on outlets like Torque News and CR and all the rest to let us know what we can expect from a car. When I write reviews on FutureCars.com, for example, I attempt to do so from the perspective of the market the car is made for. I also make sure to spell out who that market is. The Nissan Leaf is not for everyone. Neither is the Volt or the Passat TDI or whatever else. For me, the Passat is the choice, but for you, the Volt or Leaf is probably more to your liking. I agree and CR is not the magazine or report to go by. They're good with washing machines, they fall short on many other things. I think that's what we all try to do here, to write form the perspective of the potential buyer. I'll never say the i MiEV is the car to get for everyone. It's a neat city car if you have a plug and $30,000, which about $10,000 will come back in taxes. That's a small percentage of the population and for them, this car works. The i MiEV is a great car and for once the company who sells it is not pretentious and doesn't try to tell you it is THE car for everyone, as other car makers are doing.